Download "Inspection dates 19 21 March 2014. 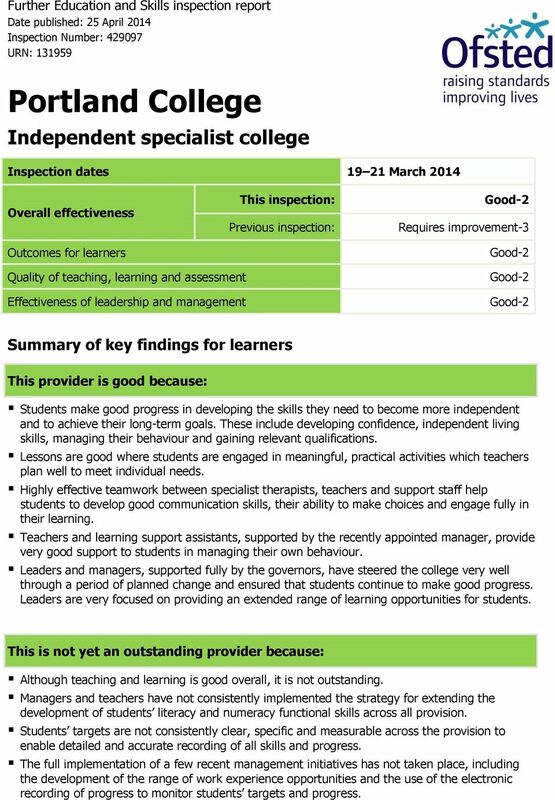 Effectiveness of leadership and management"
1 Further Education and Skills inspection report Date published: 25 April 2014 Inspection Number: URN: Portland College Independent specialist college Inspection dates March 2014 Overall effectiveness Outcomes for learners This inspection: Previous inspection: Good-2 Requires improvement-3 Good-2 Quality of teaching, learning and assessment Effectiveness of leadership and management Good-2 Good-2 Summary of key findings for learners This provider is good because: Students make good progress in developing the skills they need to become more independent and to achieve their long-term goals. These include developing confidence, independent living skills, managing their behaviour and gaining relevant qualifications. Lessons are good where students are engaged in meaningful, practical activities which teachers plan well to meet individual needs. Highly effective teamwork between specialist therapists, teachers and support staff help students to develop good communication skills, their ability to make choices and engage fully in their learning. Teachers and learning support assistants, supported by the recently appointed manager, provide very good support to students in managing their own behaviour. 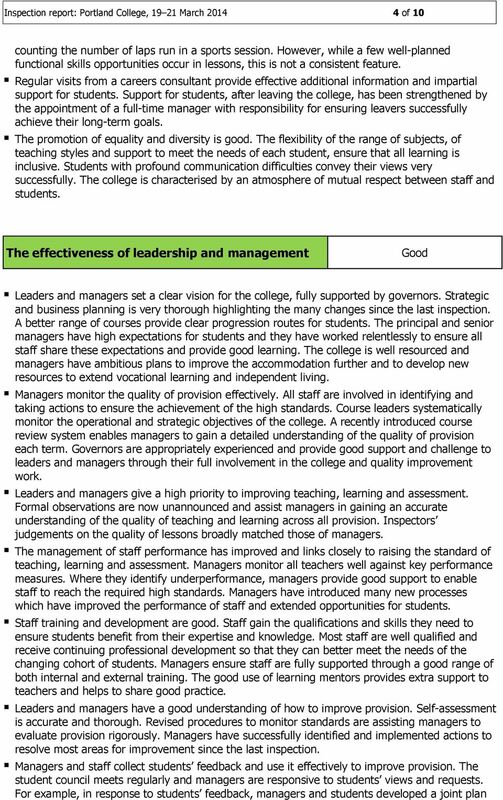 Leaders and managers, supported fully by the governors, have steered the college very well through a period of planned change and ensured that students continue to make good progress. Leaders are very focused on providing an extended range of learning opportunities for students. This is not yet an outstanding provider because: Although teaching and learning is good overall, it is not outstanding. Managers and teachers have not consistently implemented the strategy for extending the development of students literacy and numeracy functional skills across all provision. Students targets are not consistently clear, specific and measurable across the provision to enable detailed and accurate recording of all skills and progress. The full implementation of a few recent management initiatives has not taken place, including the development of the range of work experience opportunities and the use of the electronic recording of progress to monitor students targets and progress. 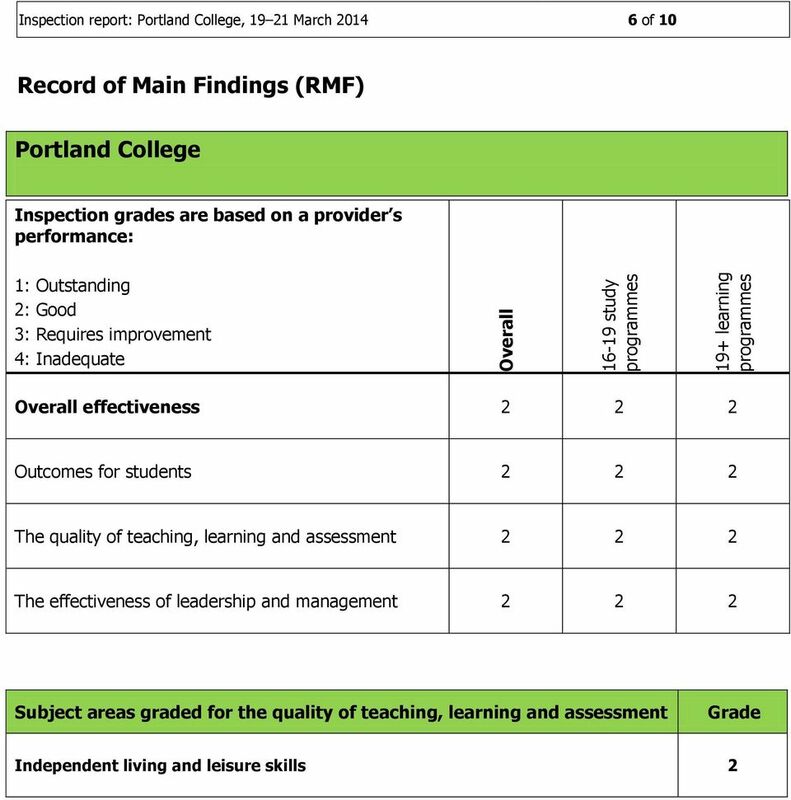 5 Inspection report: Portland College, March of 10 with the local police on safe driving around the campus. While opportunities for work experience have increased, due to recent, increased staffing, managers recognise the need to continue this development. Managers and staff promote well and continuously evaluate and monitor equality and diversity. Leaders and governors review detailed data on achievement to ensure provision meets students requirements across all levels of need, learning difficulties and/or disabilities. Managers and staff ensure students have appropriate aids and adaptations to promote access to learning to meet their needs. The use of assistive technology to support learning is good. Portland College meets its statutory requirements for safeguarding students. Managers and staff promote the well being and safety of students particularly effectively. Managers follow up effectively identified safeguarding issues, using clear procedures and guidelines. Students feel safe and are confident to talk to staff if they have any concerns. Managers and staff prioritise health and safety in lessons and they instruct students skilfully on how to keep safe within the college and wider community. 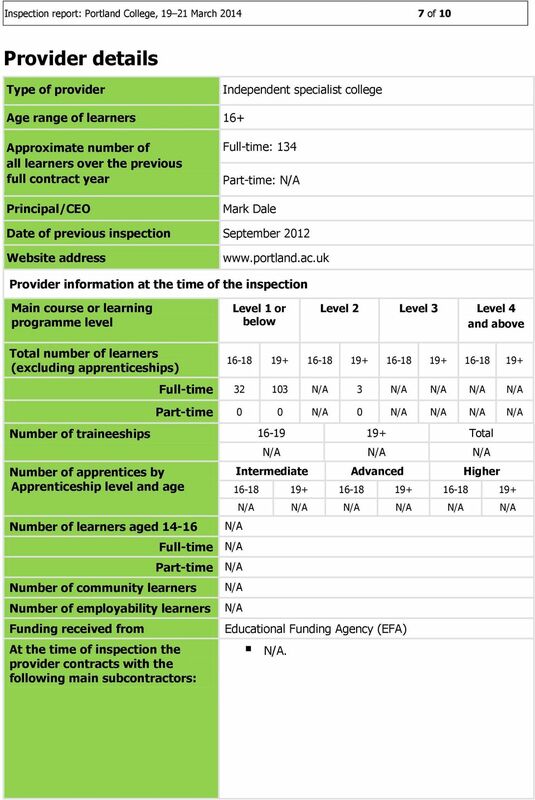 7 Inspection report: Portland College, March of 10 Provider details Type of provider Independent specialist college Age range of learners 16+ Approximate number of all learners over the previous full contract year Principal/CEO Full-time: 134 Part-time: N/A Mark Dale Date of previous inspection September 2012 Website address Provider information at the time of the inspection Main course or learning programme level Level 1 or below Level 2 Level 3 Level 4 and above Total number of learners (excluding apprenticeships) Full-time N/A 3 N/A N/A N/A N/A Part-time 0 0 N/A 0 N/A N/A N/A N/A Number of traineeships Total Number of apprentices by Apprenticeship level and age Number of learners aged Number of community learners N/A N/A N/A Intermediate Advanced Higher N/A Full-time N/A Part-time N/A Number of employability learners Funding received from At the time of inspection the provider contracts with the following main subcontractors: N/A N/A N/A N/A N/A N/A N/A N/A Educational Funding Agency (EFA) N/A. 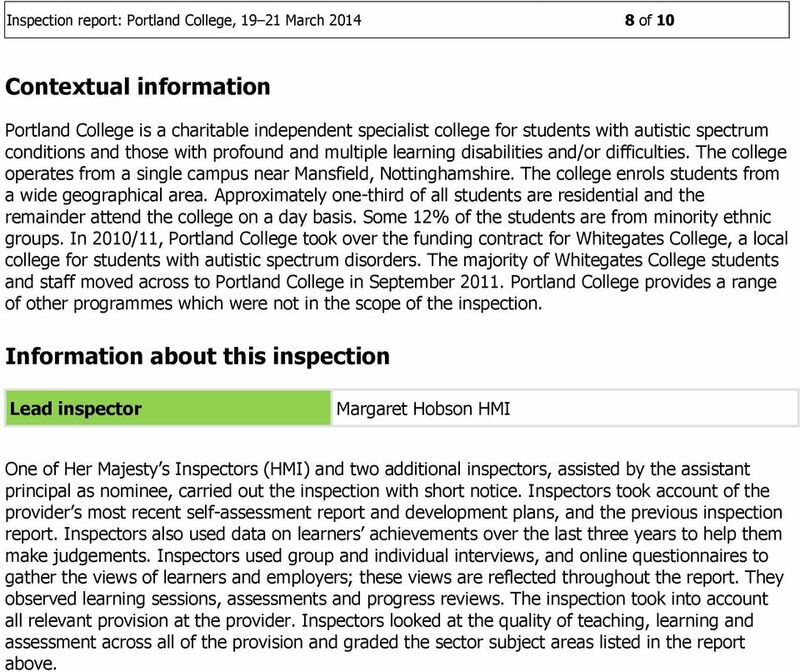 8 Inspection report: Portland College, March of 10 Contextual information Portland College is a charitable independent specialist college for students with autistic spectrum conditions and those with profound and multiple learning disabilities and/or difficulties. The college operates from a single campus near Mansfield, Nottinghamshire. The college enrols students from a wide geographical area. Approximately one-third of all students are residential and the remainder attend the college on a day basis. Some 12% of the students are from minority ethnic groups. In 2010/11, Portland College took over the funding contract for Whitegates College, a local college for students with autistic spectrum disorders. The majority of Whitegates College students and staff moved across to Portland College in September Portland College provides a range of other programmes which were not in the scope of the inspection. Information about this inspection Lead inspector Margaret Hobson HMI One of Her Majesty s Inspectors (HMI) and two additional inspectors, assisted by the assistant principal as nominee, carried out the inspection with short notice. Inspectors took account of the provider s most recent self-assessment report and development plans, and the previous inspection report. 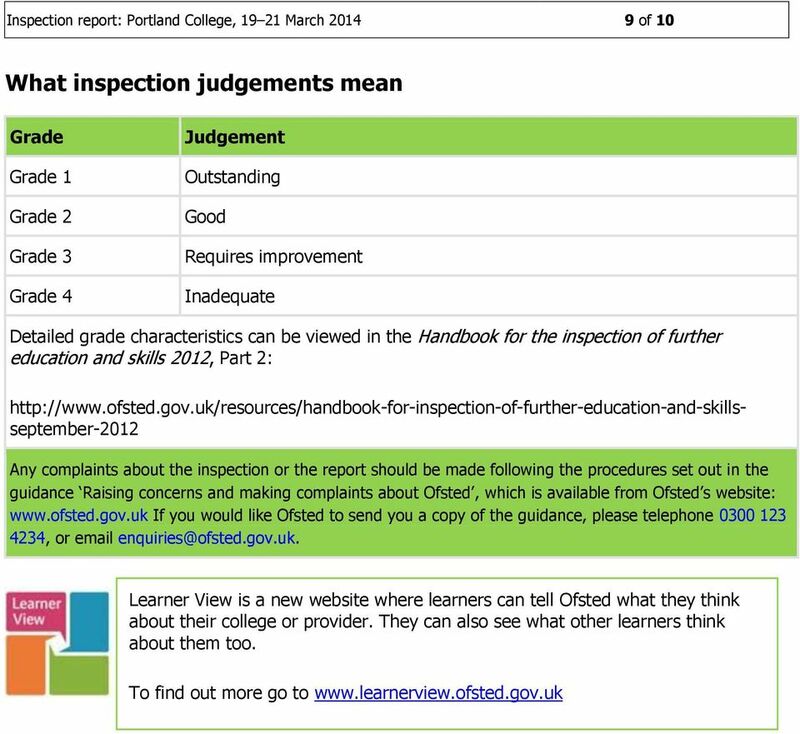 Inspectors also used data on learners achievements over the last three years to help them make judgements. Inspectors used group and individual interviews, and online questionnaires to gather the views of learners and employers; these views are reflected throughout the report. They observed learning sessions, assessments and progress reviews. The inspection took into account all relevant provision at the provider. 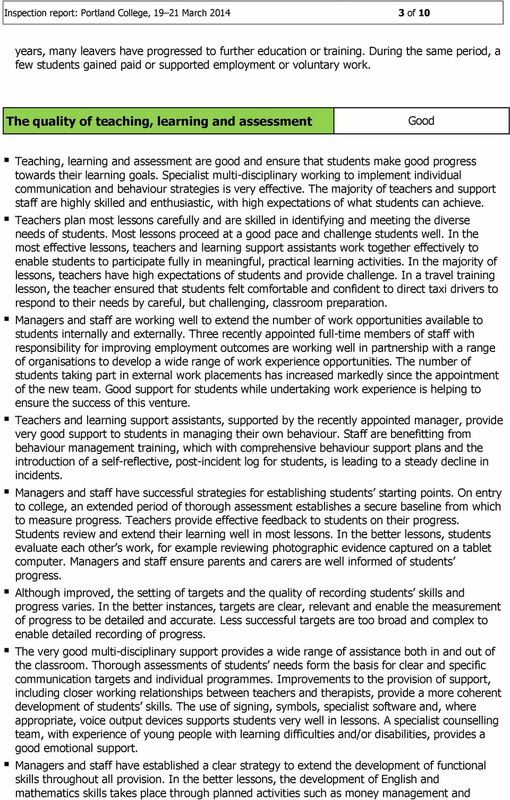 Inspectors looked at the quality of teaching, learning and assessment across all of the provision and graded the sector subject areas listed in the report above.